SodaStream is planning to open a manufacturing plant in Gaza, its CEO announced yesterday. 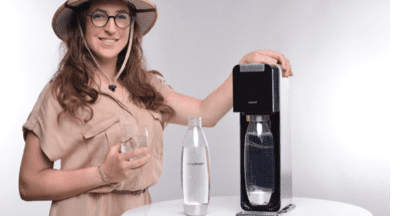 Mayim Bialik, star of the “Homoschlepiens” video campaign, with a SodaStream machine. Credit: SodaStream. In 2014, the originally owned Israeli carbonation-product company closed its factory in Judea and Samaria and moved to a bigger plant in the Negev Desert. Birnbaum said efforts to boycott SodaStream at the time only had a marginal effect on the company. These boycotts were and still are, advocated by the anti-Israel BDS movement, which includes calls to not purchase products made in the West Bank. Calm down Michael; its only a soft drink. Good luck with the Gaza distribution and production venture. Palestinian kids like soft drinks too. Is “Mecca Coke” still sold? It used to be in the UK over a decade ago. I have never drunk Pepsi Cola since after the first bottle I drank decades ago. Coke Cola has not been the same since the cocaine additive was removed and corn syrup was added. Did you know that Fanta was invented in Germany during the Nazi era and bottled in Coke Colas plant in Germany during WW2. If and ever this factory is built I wonder how long it will take before the fizz goes flat and the local Gazan terrorists target this Zionist enterprise. If Hamas the rulers of Gaza are not interested in investing their donor funds to provide employment and prefer instead to spend foreign aid on terror related activities why should the intended victims (i.e. Israelis) help them? Misguided leftist hallucinations at its worst.